Let me tell you, last week was something! Ice storm came in and electricity went out. For 3 days. Fortunately, we have a small generator that we used to power the refrigerator, some lights, and of course, wifi. Because wifi is more important than heat, you know. Except by the third day when you are aching from consistently clenching because it is so cold. In. your. own. house. And today? More snow on the way! I suppose it’s good cooking weather, provided you have electricity, of course. It’d be fun to do a post of what to cook when you don’t have electricity. The grill is always an option except when the lid is frozen shut and it’s buried in 3 feet of snow…gah! When you have electricity, these chicken burgers make a easy, tasty, and quick dinner. 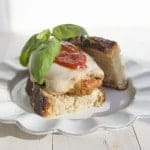 They are much easier to make than traditional chicken parmesan, which is fried, and just as good. I served mine on my homemade Philadelphia country bread. 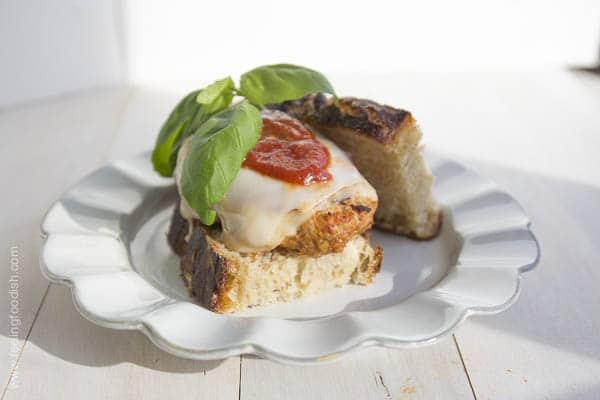 Combine chicken, 1/2 cup marinara sauce, bread crumbs, onions, and spices in a medium-sized bowl. Divide meat mixture into 4 equal portions and form patties. May refrigerate for 30 minutes or up to 1 day to help the burgers set. Heat ovenproof skillet over medium-high heat and spray with cooking spray. Grill patties for about 3 to 4 minutes and then flip and place skillet in oven for 8 minutes. Remove burgers from oven and top with cheese; continue baking for another minute until cheese has melted. Sorry to hear about the snow storm but at least you got a great looking burger out of it 🙂 That is some gorgeous looking bread — I also checked out that recipe because I’ve never heard of Philadelphia Country Bread before….and btw, if you find out how to bottle the bread smell, please let me know because I’ll be your first customer. Thanks, Trevor! That’s true! 🙂 I guess it did have its advantages..